Co-working spaces are built on the culture of collaboration and are designed to enable the networks that people seek. The world of work is changing as we speak. Technology has made it a far more open and level playing field creating a fast network of connections that are zinging like neurons conveying impulses. This quick exchange of information is reshaping our world and thus also how we work. Shorter and quicker feedback loops are helping us innovate and rethink all forms of business making them more flexible. This, in turn, is asking for the landscape of work to rethink its physical and social formations. Gone are the days of generic, endless square feet of cubicles and in are the days of complex social workplaces where interactions are key. The waves of entrepreneurial models are leading this change and they need constant feedback to stay nimble. Big business too is looking at new models on the horizon to stay relevant rather than erode to oblivion and that is further spurring on the growth of the startup ecosystem. Co-working spaces, being inherently a shared model, fits right into this new way of working. It serves as the platform for exchange; a sort of neutral zone where different companies no matter the size can ideate to build bolder new visions for the world. The freelance culture is taking shape across the world where more and more people are choosing to work on their own terms. Contrary to popular opinion, this entrepreneurial spirit does not come with isolation. In fact, people are seeing the value in collaborating at the right moments to help each other grow. Co-working spaces are built on the culture of collaboration and are designed to enable the networks that people seek. The presence of open workstations, brainstorm rooms, pantry, and other informal spaces provide a workspace where people can choose how they wish to work giving them a sense of freedom that inherently breeds innovation. Further, beyond the myth that co-working spaces are primarily for freelancers and entrepreneurs, companies of all kinds are leveraging these spaces and finding them useful. Co-working spaces help divvy up the real estate of the office space to sizes that previously did not exist in such quantities. Getting space from a 2 to 40 seater has traditionally been quite difficult. 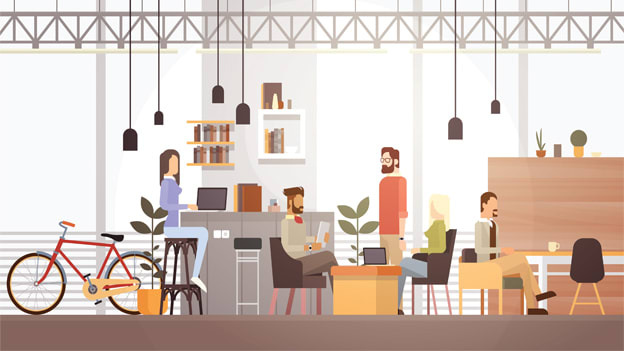 With the increase in co-working spaces the supply of a variety of sized offices have increased and this allows both established companies and entrepreneurs to get affordable space. And because a large area is shared amongst all the savings can be up to 25% of a conventional office space. The flexibility of office space sizes has also given companies the ability to allow their workforce to work from where they want and when they want. It also gives them the freedom to spread their workforce to work across geographies and expand their business faster. Sales teams can set up shop in cities where headquarters or regional office does not exist and start bringing in business or scout teams for foreign businesses can set up their first office to start setting up networks and establishing the foundations for the business. In short we don’t have to be in the same space at the same time to do business with each other. This flexibility of real estate coupled with end to end services gives co-working the edge. Co-working spaces provide end to end services where all one has to do is to come and sit down to work. Managing the office space, worrying about maintenance, paying the bills etc. are problems that business do not need to worry about. Even if you need an executive assistant and Viola! one can be provided. This provides a boost to all companies and more so to entrepreneurs. Being an entrepreneur can be a lonely road but given the networks of co-working spaces and their no maintenance, model provides the right kind of space for them to grow. As the growth of co-working takes place new models are springing up. One of these models, that benefits the entrepreneur, are incubation co-working spaces. These are platforms, who for a stake in the business, usually provide a range of benefits such as free office space, mentorship, business advisory help, financial support and even legal aid. This kind of support can really help entrepreneurs spend their time wisely and help ensure they are going in the right direction. Some models in Europe are even creating curated co-working spaces where the community is picked through an interview process so as to ensure a complete reinforcing environment. Here, companies that are associated based on similar aspects, help each other grow. These different incubation centres can be a boon and essentially lend the sea legs a business needs in the tumultuous waters of the first years. The growth of coworking is owed to the changing world of work where constant entrepreneurial innovation is the new normal. This innovation is built on quick feedback loops that can only be fed through collaboration and co-working spaces provide the platform for just that. Due to efficiencies in cost, the benefits of networking and general ease of doing business co-working spaces are great magnets for entrepreneurs and as a result so are they for established businesses as the synergies in working together far outweigh going in parallel lines. Robin is the Architect, Founder & CEO at Dextrus.